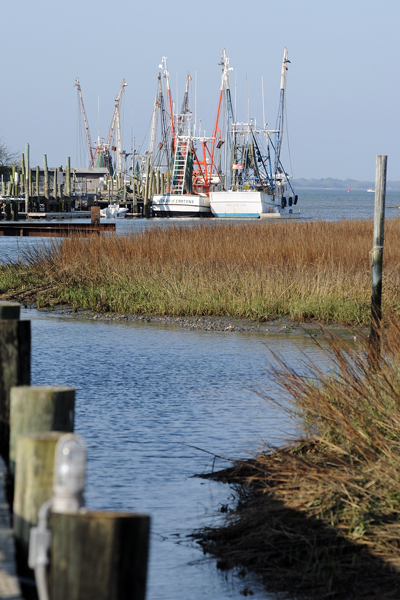 The beauty of the low country is especially evident in and around Shem Creek, one of my favorite places. My mother and I got up early to take photos and observe several famous Charleston artists, including Mary Whyte, in the act of “plein air” painting. A sizeable audience was already ensconced observing them when we arrived, so we wandered around on the pier taking photos and soaking in the morning rituals of the shrimpers and fishermen preparing their boats. The lengthy pier we usually walk is under renovation, so we spent most of the time near the commercial boats and restaurants. Nevertheless, the smells of the crusty nets, discarded oyster shells and stagnant pools added to the atmosphere dense with color and texture. While the working boats remained at a distance, they still provided a beautiful backdrop to the meandering creek.